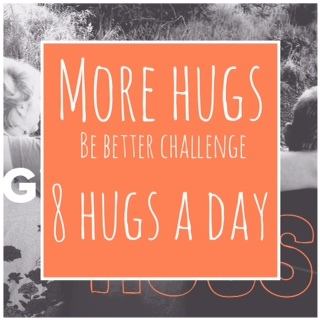 This week’s Be Better Challenge is to give more hugs. Why? Well, because of a little thing called oxytocin that can improve your physical and mental health. Oxytocin is a neurotransmitter that acts as a hormone and is released when we feel safe and connected. It’s mainly associated with improving health, including enhancements in heart health, and decreases in blood pressure, heart rate and cortisol levels. Recently, research has demonstrated that acts of caring, compassion and physical contact (such as hugging, massaging and holding hands) help bring oxytocin levels up – which, in response, will brighten your days! In addition to the physical benefits of hugs, psychologist Paul Zak highlights the benefits to our mental health. In one of his studies, he found that participants who had been dosed with synthetic oxytocin were 80 percent more generous than a control group and more trusting of the strangers they encountered. He also found that oxytocin helps in building relationships. The researchers found that oxytocin improved positive communication between couples, and that partners with higher levels of oxytocin had more partner support. Another benefit is that oxytocin helps improve memory. Clinical psychologist Adam Guastella and colleagues conducted a study on the role of oxytocin in recalling faces with happy, angry or neutral facial expressions. The final results show that Oxytocin can, in fact, impact our memory, influence the way we think and help us appreciate positive experiences. So have we convinced you that giving hugs is worth your time? Hugging, befriending new people, prayer, and bodywork are all great ways of increasing your oxytocin levels. Zak prescribes eight hugs a day – lasting for 20 seconds or more – to help feel more connected with the relationships you have. This week’s Be Better Challenge is to increase the amount of hugs you give out daily. By increasing your oxytocin levels, you can improve your physical and mental health. Now, go out and hug people!